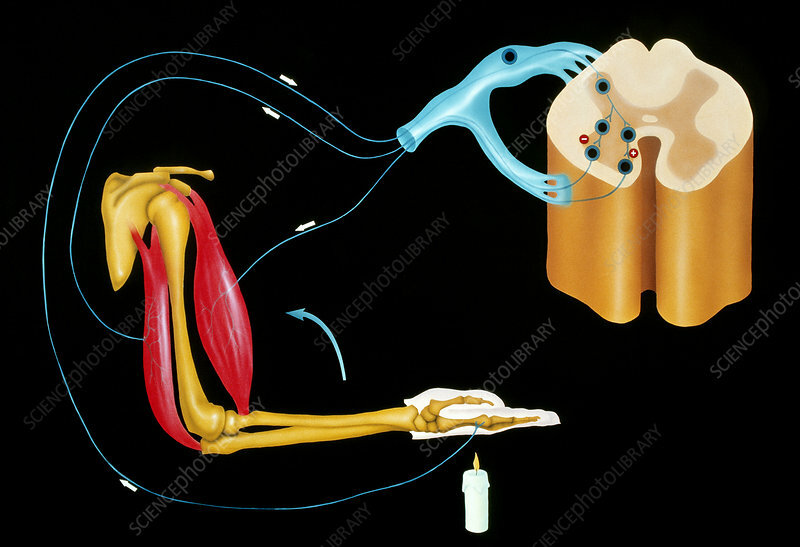 Illustration depicting the human nervous reflex arc, showing the components involved in the muscular response of the arm to the stimulation caused by the heat of a candle flame against the hand. The pain impulse passes via a sensory nerve from the hand to synapses (junctions) in the white matter of the spinal cord (top right) which connect with two motor nerves that supply the biceps (right) and triceps muscles in the upper arm. Thus the sensation of pain caused by the heat of the flame provokes an upward jerk of the hand.